Stockton Civic Theatre annually offers a Summer Youth Program, SCT Jr. Stage, for youth interested in acting, singing and dancing and culminates in the production and presentation of a full-scale musical. Stockton Civic Theatre also offers a Summer Youth Program, SCT Jr. 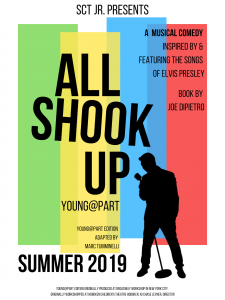 Crew, for youth interested in stage craft, design, construction of sets, props, and costumes and culminates in the production of a full-scale musical. Stockton Civic Theatre, Jr. Summer Programs provide challenging, innovative, high-quality arts education opportunities to its students. $650 for 2 children in the same immediate family. *Enrollment is on a “First Come / First Serve” basis and begins Sunday, April 14th, 2019 from 10am – 12pm (SCT Box Office will be open special hours for the first day of Open Enrollment). Enrollment can only be done in person, with student’s guardian present, at the SCT Box Office Window, during Sunday, April 14th, 2019 from 10am – 12pm or during SCT Business Hours (Tues. – Fri. 9am – 2pm) starting Tuesday, April 16th, 2019 if spots are still available. There is very limited availability for both SCT jr. Stage & SCT jr. CREW and we highly recommend you come Sunday, April 14th, 2019 to secure a spot. Tuition is due and must be paid at the time of enrollment. This year we are excited to offer 2 different types of scholarships! This scholarship is available to any student who is planning on enrolling into the 2019 SCT JR. Summer Youth Program. This scholarship will provide partial financial assistance toward the total of the student’s tuition. To apply for this scholarship, fill out the scholarship form below. This scholarship is available to any student who is enrolling into the SCT Jr. Summer Youth Program for their first time. Bill’s dream was to provide theatre opportunities to children who may not otherwise had the financial means to do so. This scholarship will award a FULL Coverage of the student’s tuition. To apply for this scholarship, fill out the scholarship form below, which requires a 500 word easy. All Scholarship WINNERS which receive an email notification no later than Sunday, April 7th, 2019. * Filling out this form does not guarantee your student a 2019 Scholarship or a spot in the 2019 Summer Youth Program.